With the launch of Transportify in the Philippines, you will finally be able to book a “same day full service” motorbike, economy vehicle, L300 vans, pickup trucks, or closed vans to pickup and deliver almost anything for you throughout Mega Manila and surrounding areas. Book for immediate pickup and your driver will arrive within 60 minutes or prescheduled anytime up to two weeks in advance. You can book and use Transportify service from our mobile app available on Google Play and Apple App stores or our business-friendly web app available from any desktop, laptop, or tablet that is connected to the internet. Booking the vehicle you want on the same day with a full service driver has never been easier! 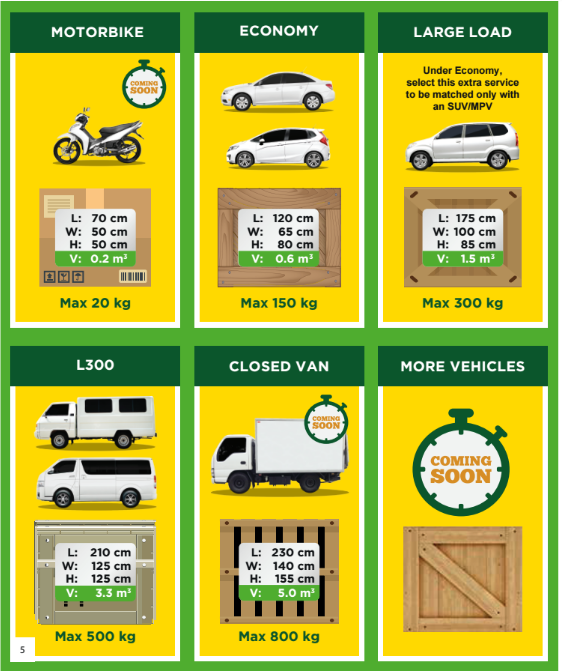 Pay for just what you need, whether it is a few boxes or a full vehicle load. Our motorbike starts at ₱100 for the first 3 km and ₱10 for every km thereafter. For medium-sized deliveries, the economy vehicle starts at ₱250 for the first 3 km and ₱20 for every km thereafter. Need a larger vehicle? We have an available L300 vans for delivery, and it only costs as low as ₱600 for the first 3 km and ₱30 for every km thereafter! Included in this Standard Fare is full service loading and unloading by your driver within 5 meters from the vehicle. But don’t worry, if you need your driver to do more work, you can select Extra Services such as Special Help by Driver or Extra Helpers to assist with larger or more complicated tasks. If you are looking for a large vehicle that delivers up to more than 10 locations, our L300 vans for delivery offer flexible services – you can have a full day option (10 hours) only for a flat price of ₱2,800, and still be able to have any Extra Services of your choice. For your convenience, the options are almost limitless! A full listing of our vehicle types is provided below. Know more about Transportify by visiting our website at www.transportify.com.ph or downloading our mobile app at the Android Play or Apple App stores. If you’re a business or SME, learn more about our popular Business Program by visiting https://www.transportify.com.ph/business/ or emailing business@transportify.com.ph. With Transportify’s same day delivery service options, getting a package to and from Manila has never been easier. The company aims to revolutionize package delivery services in the area and surrounding provinces by introducing innovative ways of getting the package delivered on time, all the time. ©2018 Deliveree Private Ltd. All rights reserved.